Hace unos días Marina y yo fuimos a ayudar como voluntarios en la primera edición de la Red Bull Defiance Wanaka. Es una carrera divida en dos días y en la que en total los participantes, parejas, deben recorrer un total de 71 km en bicicleta de montaña, 50 km corriendo por el monte y 32 km navegando en kayak acumulando un desnivel de 5096 metros. Nosotros fuimos a ser “run marshalls”, que significa “los de los petos naranjas que evitan que te pierdas”. Fue una actividad interesante a la que nos apuntamos con la intención de matar dos pájaros de un tiro: ir de excursión y echar un cable. Al final no pudimos disfrutar del paisaje todo lo que teníamos pensado pero fue una experiencia positiva. Lo poco que pudimos ver de Wanaka nos gustó mucho por lo que volveremos, sobre todo después de haber descubierto la carretera “Crown Range” que comunica Queenstown con Wanaka. La semana pasada tuvimos un día de lo que aquí se conoce como “gale”, pronunciado “gueil”, que básicamente es viento huracanado. Tuvimos rachas de viento de entre 90 y 100 km/h, la casa entera se movía, la gente se caía al suelo, a las abuelas se les fastidiaba la permanente... Apocalíptico. El invernadero estaba bien anclado a la casa pero el viento fue tan fuerte que logró desmontar sus soportes internos por lo que todas las plantas cayeron al suelo y se quedaron ahí agonizando hasta que pudimos salir a rescatarlas. Fue un espectáculo dantesco: las lechugas luchaban por sobrevivir entre montañas de tierra, las acelgas abandonaron toda esperanza al precipitarse sobre ellas el tiesto del perejil, que a su vez fue enterrado por los pimientos. Las semillas de albahaca optaron por un suicidio colectivo junto a los ajos tiernos y los cebollinos y mientras tanto, los tomates observaban agonizantes desde la ventana. De todas formas, como parece ser que escribió Sir Ernest Shackleton en sus diarios durante la expedición al Polo Sur a bordo del Endurance, “difficulties are just things to overcome, after all”. Que traducido al castellano significa que, después de todo, el fútbol es así. A week ago Enrique and I drove up the Crown Range to volunteer in the first ever the Red Bull Defiance taking place in Wanaka. Over this two-day race, the two-people teams completed 71 km mountain biking, 50 km running and 32 km kayaking while covering 5,096 m of vertical drop. Our role as “run marshalls” consisted basically in guiding the athletes so they’ll follow the track so, on one hand, discourage cheating and, on the other, prevent them to get lost in the hills. Overall it was a nice experience as, a part from helping, we enjoyed the wee hikes, the views and the days out. However, we were quite busy so we couldn’t enjoy the area as much as we had planned and some of our locations weren’t what we expected (we thought we’ll be at the end of a 3 hours climb but unfortunately that never happened). Anyway, we loved the little Wanaka and, after discovering that the Crown Range road is not only awesome but also faster than what we thought linking Queenstown and Wanaka, we’ll definitively go again soon. Last week we had gale for a few days. We had gusts running at 90 and 100 km/h: the house moved, people felt down to the ground, grandmas’ new hairstyles got ruined… Terrible. James and Enrique did a great job anchoring our little greenhouse to the floor deck. 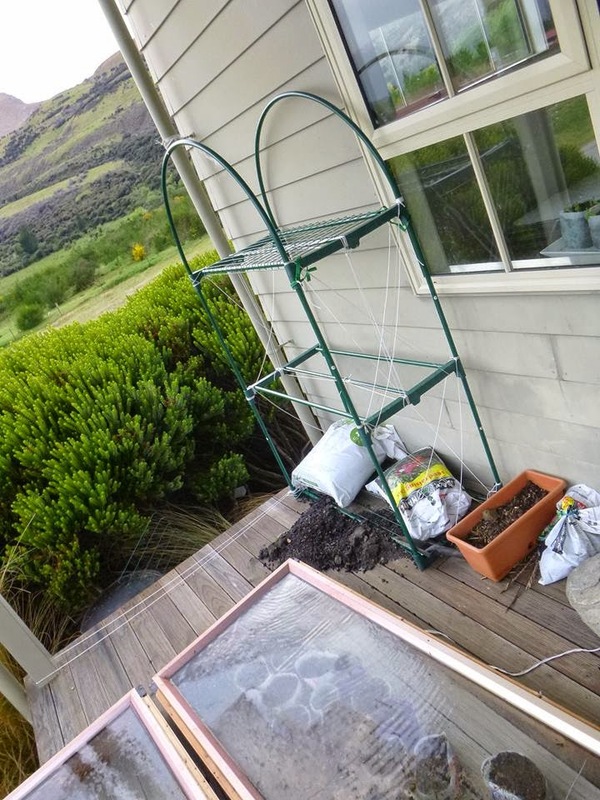 However, the wind was so extreme that managed to disassemble (not break) the greenhouse itself in a way that all my little plants were left agonizing in the floor. I was lucky enough to be at work when the mess was discovered otherwise I’d have passed out. According to Enrique’s chronicle, it was a Dantesque spectacle: all these tiny lettuces fighting for their lives around mountains of soil, my purple silverbeets lost any faith when the pot of parsley felt over them and the peppers and chilies on top of this last one at the same time. The basil seeds, which had just started showing their firsts extremely cute green leaves, chose to do a group suicide along with the spring onions growing in toilet paper rolls and a massive pot of chives. Meanwhile, all the tomato plants stared at the drama through the window knowing that their time will also be over soon. Nevermind, like Sir Ernest Shackleton wrote in his diaries during his expedition to the South Pole on board the ship Endurance, “difficulties are just things to overcome, after all”.